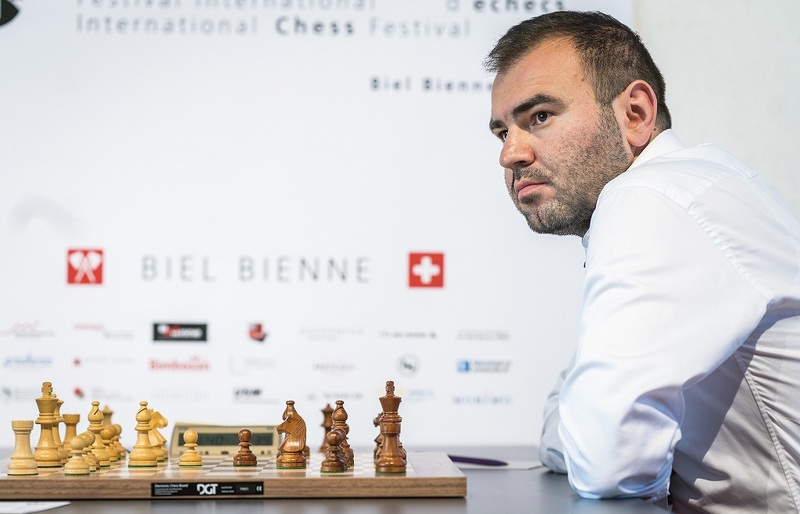 Shakhriyar Mamedyarov defeated Nico Georgiadis with Black to become the sole leader at the Accentus Biel GM Tournament. 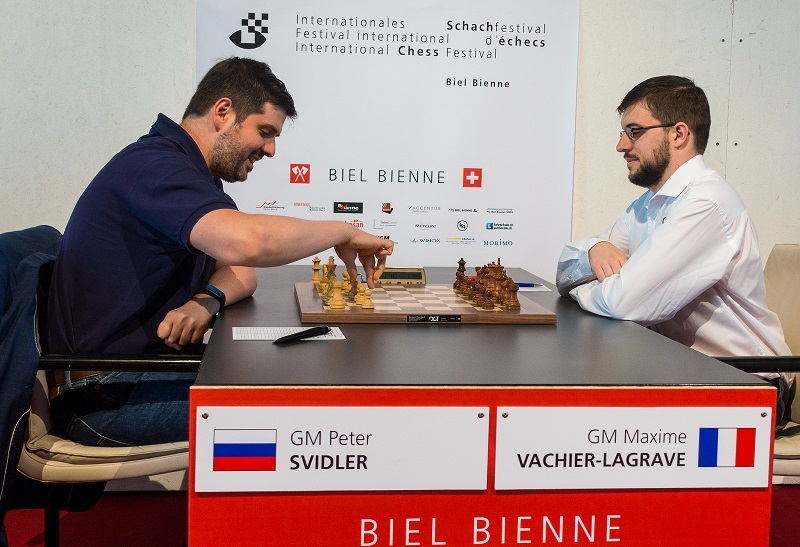 Meanwhile, David Navara drew Magnus Carlsen, and Maxime Vachier-Lagrave took down Peter Svidler after the Russian went astray in, according to himself, "self-mate fashion". The players mentioned that they were tired, and they seemed eager to finally get a rest day. I was just exhausted after the many long games in a row, so I just wanted to play something simpler. [...] I feel like I did suffer a bit today, so I was hoping to avoid that. In that sense, it was not a success. Okay, a draw against the World Champion is a good result. Now I'll try to regroup, and I'll be getting back to business after the free day. My downfall was that I saw this idea of playing e5. If I don't notice this exists, I'd never lose this position because I have no weaknesses and... just Ke2 Rac1 and nobody's better. After scoring 0.5/3, I'm probably giving up on playing this against you, so I can tell you: there is really nothing wrong with playing h5 in this position. Just nothing at all. 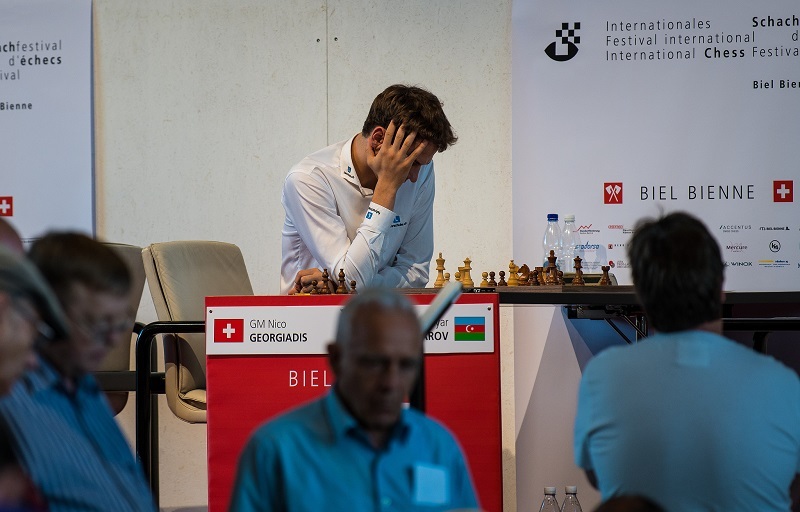 Svidler played 28.g4, and after 28...fxg3 Black has a big attack against the king with the rooks on the f-file and the light-squared bishop on the long diagonal. Peter's resignation came quickly, on move 31. I just had this absolute blackout, where I spent over 20 minutes looking for the most secure way to make a draw, and what I ended up doing basically allows mate-in-5 with checks. Basically, a nice little help-mate study was my contribution to the world today. I am assuming I have a doctor's appointment tomorrow. I'm an old man. I have, you know, aches and pains and ailments of all kinds. The problem is that if I play g6 I can play every time g5. If I play g5, I can never play g6. Nico played 30.Nc3 instead of capturing the knight on f5. This allowed Mamedyarov to put his knight on d4, where it controls many key squares. According to Shak himself, had White taken the knight on f5, "White is simply better". Shak's attack was straightforward and effective. The players shook hands after 39 moves. My big advantage is that I started playing chess too late, when I was 9. I like to play chess. When you start at 4-5, by 33 you think you've played too much. But now I'm like some 26-27-year-old players. Yes, I think it's quite important... but I think this is not my problem. I think I have other issues (laughs). The final four rounds will be played from Sunday until Wednesday after the players recharge their batteries on Saturday. 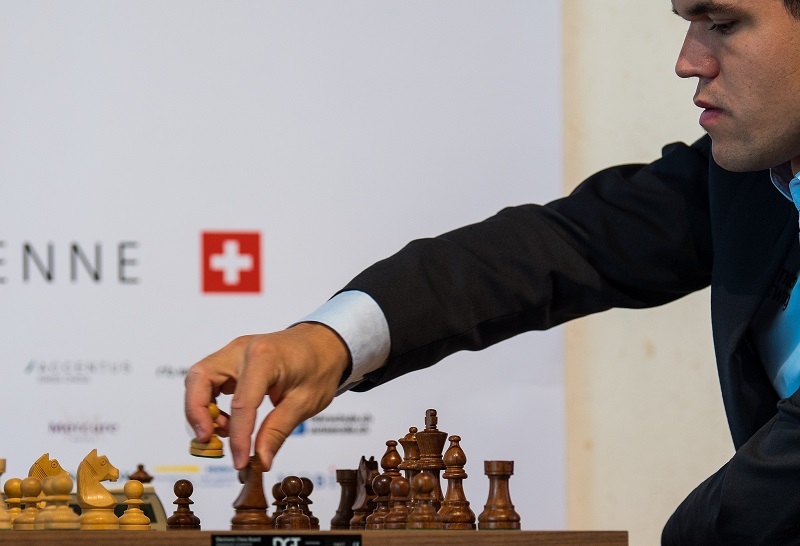 Don't miss the action live here on chess24!